First transaction-based wood fiber price report for the Midwest, Forest2Market Delivered Price Benchmark, brings transparency to the market. Fourth quarter 2012 total fiber prices for aspen, softwood and hardwood reported. We’re confident that bringing the benchmark service that has been so successful in the South and the Pacific Northwest to the Midwest will bring a level of transparency to the market that will benefit all. Forest2Market announced today that it has begun providing its Midwest subscribers with its Forest2Mill Delivered Wood Fiber Price Benchmark, the first transaction-based market price report available in the region. 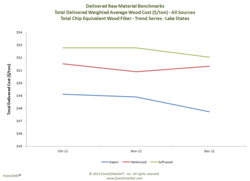 According to the report, the Midwest delivered cost of total wood fiber (pulpwood and chips) was lower at the end of 4Q2012 for all species. Aspen fell 2.8 percent over the course of the quarter, moving from $49.10 per ton in October to $48.89 per ton in November, and then to $47.73 per ton in December. The delivered cost of hardwood fiber started the quarter at $51.51 per ton, fell to a quarterly low of $50.88 per ton in November, and then recovered nearly all that loss in December, ending at $51.31 per ton. Softwood total fiber remained steady in October ($52.78 per ton) and November ($52.77 per ton), but then fell to $52.04 per ton in December, a drop of 1.4 percent. All prices are in chip-equivalent tons (pulpwood less bark and accounting for fiber loss). Coutu is currently working with industry leaders to develop a similar product in the Northeast. Headquartered in Charlotte, North Carolina and with offices in Eugene, Oregon and Appleton, Wisconsin, Forest2Market provides market pricing data as well as wood and fiber supply chain expertise to customers in the forest, wood and paper products, recovered fiber and bioenergy industries. For more information, visit http://www.forest2market.com.